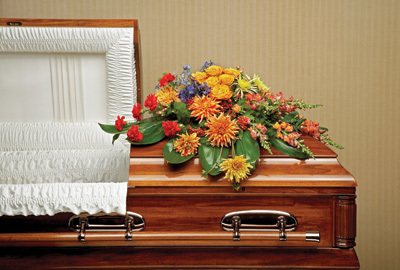 A graceful casket floral arrangement of colorful blooms in warm tones adorns the casket in celebration of someone dear. Flowers are lovingly arranged in a spray design accented with greens for depth and contrast. Four Seasons Flowers is your local florist for sympathy floral arrangements in San Diego. Contact us today.